Many Pakistani people are now entertained by the ‘dancing bears’ show. Bears, kept in heavy chains, are forced to perform circus-like degrading tricks on the streets, as people tune in and pay to see this heartless show. What people do not realize is the fact that there is nothing entertaining about these shows. Bears are usually taken away from their family when they are cubs; they are deprived from any social communication and undergo exhausting and never-ending training sessions each day so they can learn to perform these tricks. Proper food and water are a luxury (they are listed as ‘costs’ for the people making the big money by exploiting them); is this the life we want for these bears? Aminals is outraged that this ‘tradition’ is still allowed to continue in Pakistan and that no authority has taken action against this practice. If a thing has been done for a long period of time, this does not make it right! 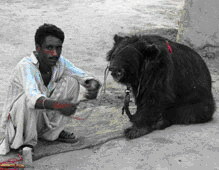 Bears are fast becoming extinct and few are left in Pakistan, although no one knows the exact number. The remaining ones are now mostly found in Swat and the Northern Areas. And the poachers are even after them. They usually kill the mother bear in order to take away her young cubs as she otherwise vehemently resists taking-over the cubs. Some of these cubs so taken away die from neglect or dehydration before they are sold for training. 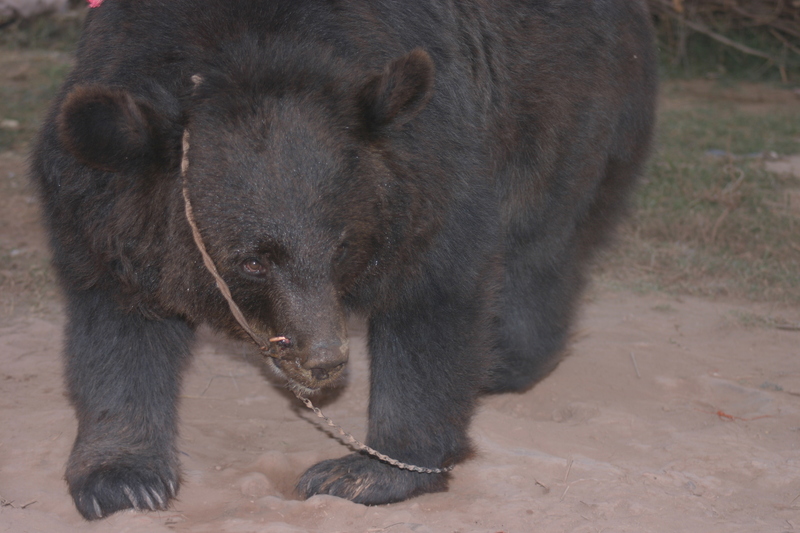 If sold, a hole is pierced through the cub’s lips, nose or palate, and a chain or rope is forced through. No anesthetic is used for this highly painful operation. Teeth are often removed or broken to prevent injury to the handlers. 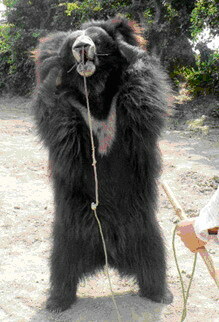 Tugging on the rope prevents these fresh wounds from healing, and the bears find no relief from raw, painful infections. The bear learns to ‘dance’ in an attempt to avoid the pain. Thus starts a life where the bear is dragged from village to village dancing for audiences. These bears are seldom given proper diet, and the poor diet thus has an adverse effect on the health of dancing bears. Many suffer from cataracts and go blind due to an inadequate diet. The trauma of this unnatural life drives many bears mad and they display stereotypic behaviors such as pacing, swaying and self mutilation. No one knows the exact numbers of bears in Pakistan that are forced to dance for public entertainment, or used for baiting purposes. Rescuing such a bear is obviously the first step. However, related problem is where to place them after the rescue. There is a need to collect the addresses of all the dancing bears. The number is not likely to be more than a few hundred. Subsequently, steps can be taken to rescue these bears, and shift them to a national park or a sanctuary. A sanctuary existed at Kund near River Indus in the KP Province, but was destroyed in the 2010 floods. The same foreign organization has now opened a sanctuary at Balkassar but it continues to suffer from lack of funds, and thus neglect. It is a pity that we have to depend on foreign donors even to look after a couple of hundred bears, and cannot look after them from our resources. This is particularly sad as we ourselves are responsible for their plight as otherwise they could have been doing fine on their own in the wild. In India, an Integrated Sloth Bear Conservation and Welfare Project was initiated in 2005 to work towards the holistic conservation of bears, by providing alternative livelihoods for Kalandars and ensuring that the bears do not endure lifelong distress. Our Governments may consider initiating a similar project inPakistanon an urgent basis. Visit the Integrated Sloth Bear Conservation and Welfare Project website for more information about WSPA’s work with WTI. Previous Previous post: What Can Be Done to Stop Cruelty to Dancing Bears?